Looking to build an awesome home bar in your house? These 34 home bar ideas and designs with free plans will help you create a space everyone will be green with envy about. Whether it’s an outdoor gathering of friends and family or a dinner party inside, you want to be sure you’re well-stocked with drinks and refreshments for everyone. 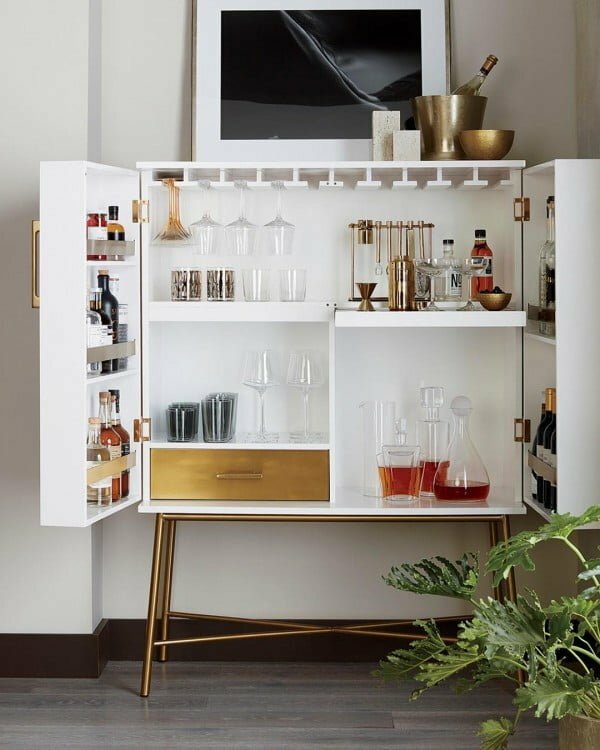 A table or even a bookshelf will do passably well for stocking your hard liquor, wine, and mixers at first, but your own separate bar will add much more style along with functionality. 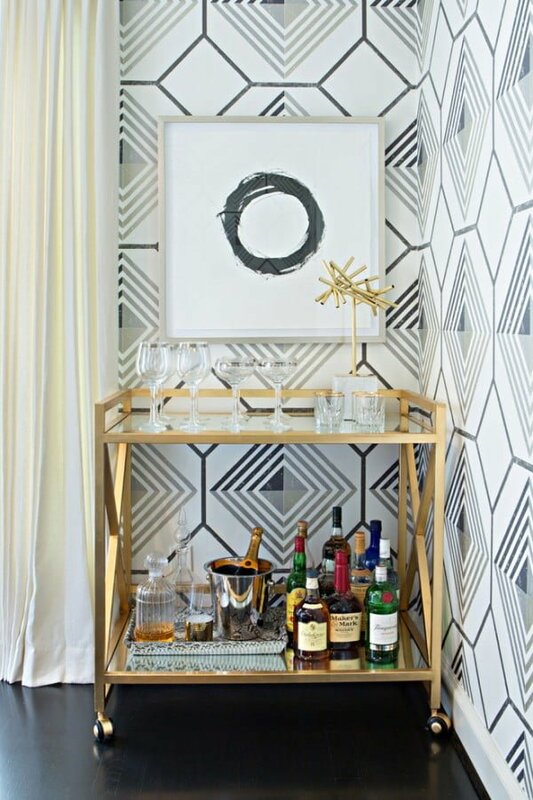 A home bar you made yourself is even better because it’s sure to spark conversations once your guests learn you completed one of these awesome projects yourself. 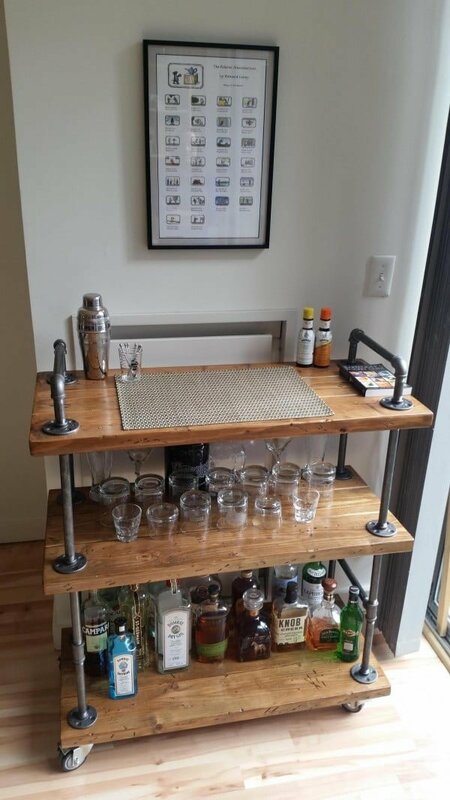 With the right materials and some basic instructions, you can have a home bar that your neighbors wouldn’t be able to buy at the local furniture store. 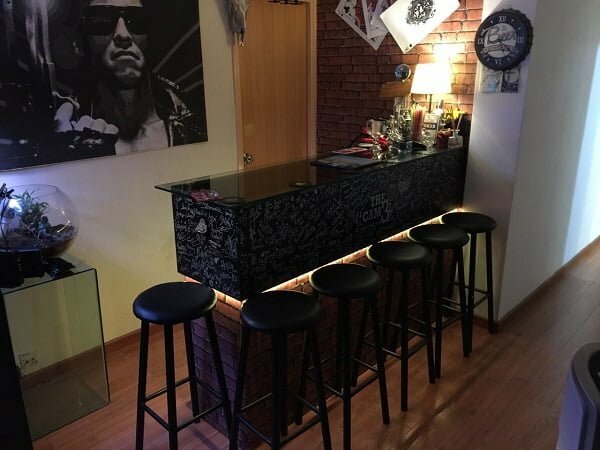 How much does it cost to build a bar in your house? How wide should a bar top be? How tall is an average bar? Anywhere from $20 to $12,000. 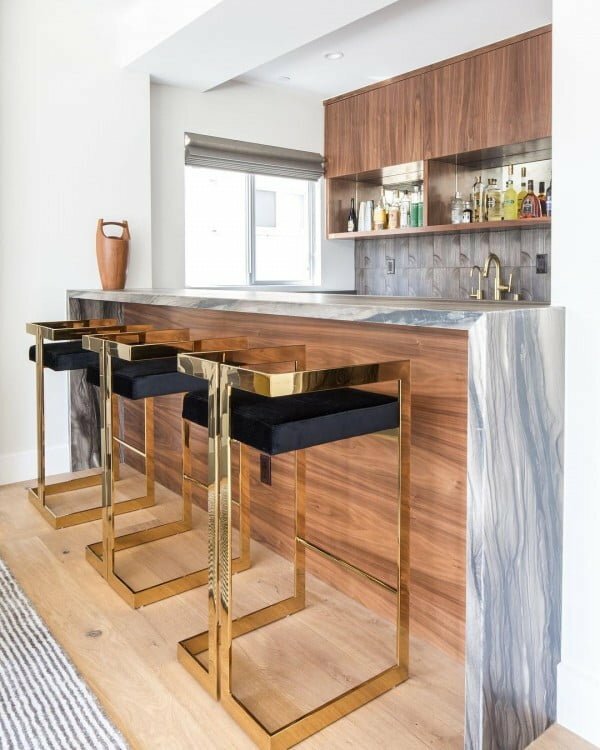 It all depends on whether you build your bar on already existing countertops and just adding a bar cart, or you’re building a big basement bar with marble countertops. The price depends on your budget and varies greatly. 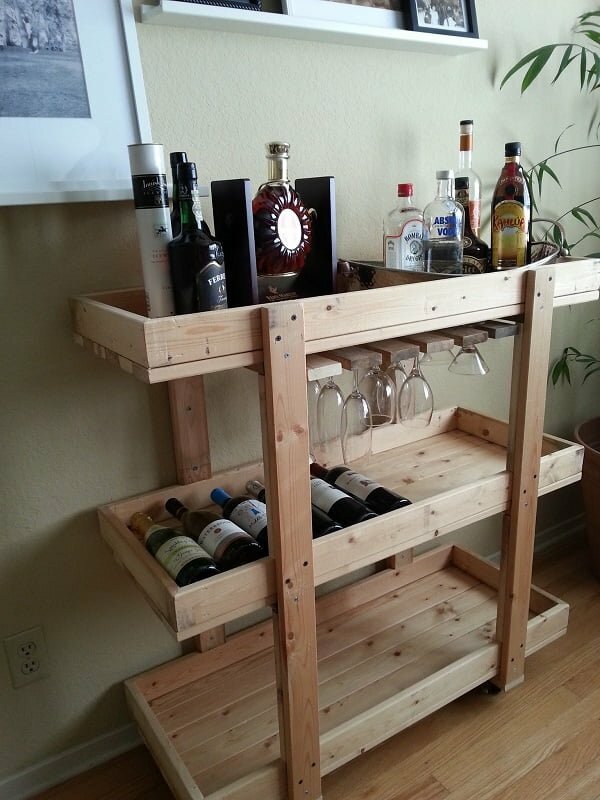 It’s good to know, though, that you can fit virtually any budget to build your own home bar. 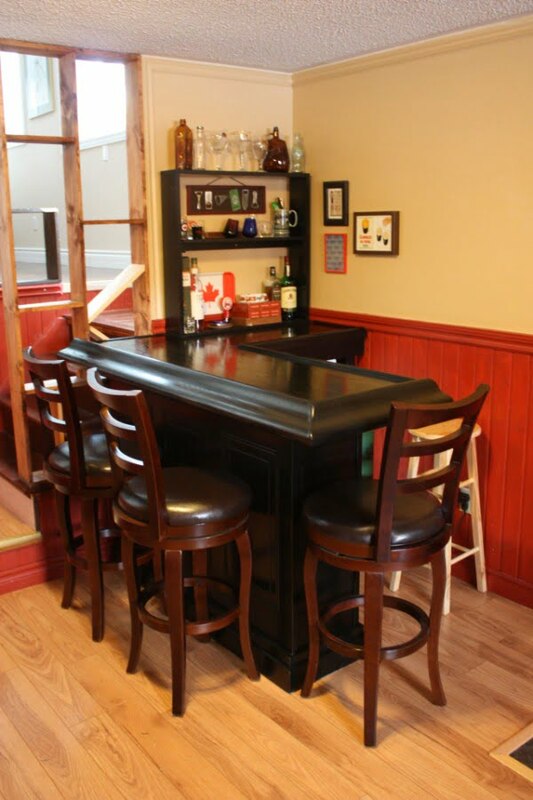 It’s important to note that commercial bar tops are typically much wider than home bars. That’s to accommodate drink rails and troughs which are a necessity in a commercial setting. Your home bar, on the other hand, can be narrower at 12-16 inches – just enough so it’s comfortable. The answer is 42 inches tall. You don’t have to build a bar at the exact height but it’s the most comfortable height in most cases. 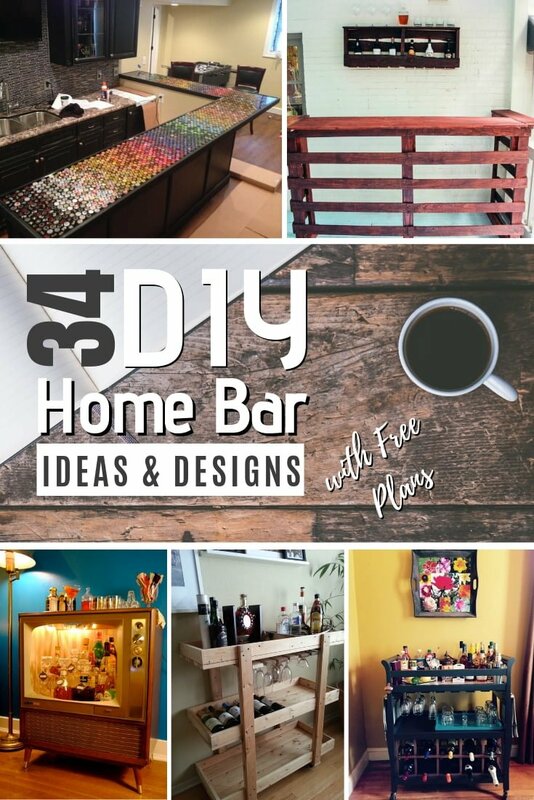 Check out the following 34 DIY home bar ideas (most of them with free plans and instructions) that you can build on any budget. Looking for some unique whimsical ideas for a home bar that will serve as a decor accent and a conversation piece? 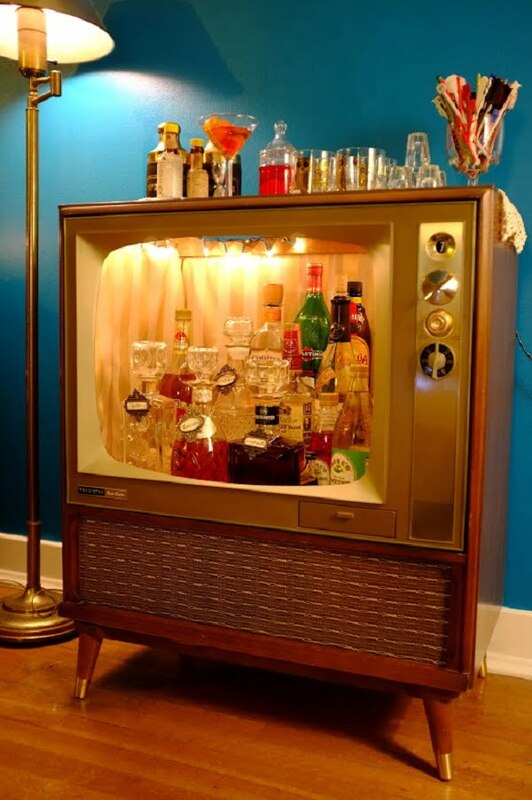 How about this vintage 1960s TV turned into a small bar. It’s a very cool project and you can make one yourself too as long as you can get your hands on one of these old TVs (try a flea market or Ebay). Here’s another whimsical and very unique idea that will get you excited. 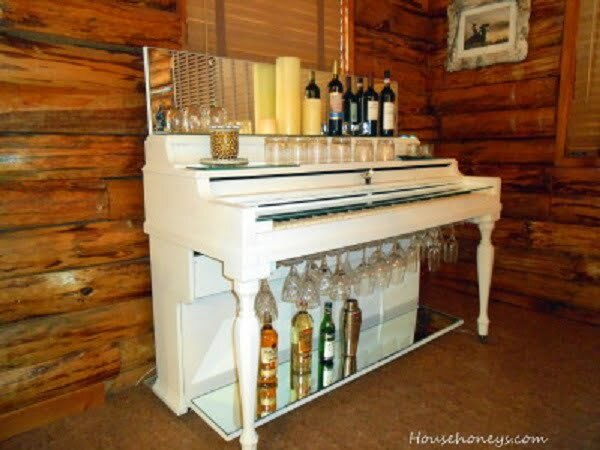 You can turn an old piano into a home bar. Actually, it’s even easier than in the case of the old TV. Not only that, but a piano gives you much more storage space and it’s big enough to be a genuine bar. If an old TV and a piano can make a home bar, then an old bookshelf can very well work too. It’s an easy project. 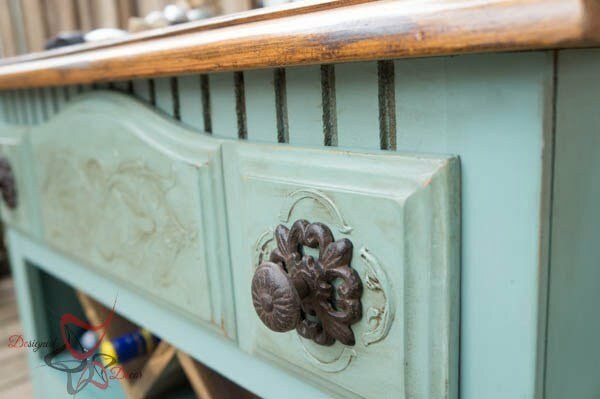 All you have to do is re-paint a used bookcase (your own or a flea market find) and that’s it. You get a lot of storage and display space for your drinks. 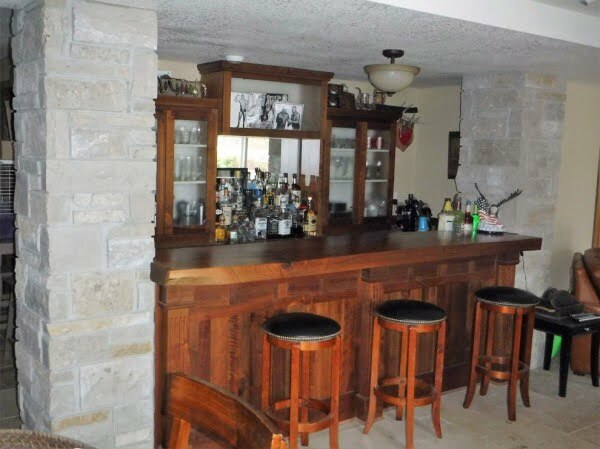 A genuine home bar. You’re never too young to start drinking. Actually, you are. But for the purpose of this home bar idea, you can turn an old crib into a bar. It works the same way as a bookcase. A very simple project and a spectacular result. 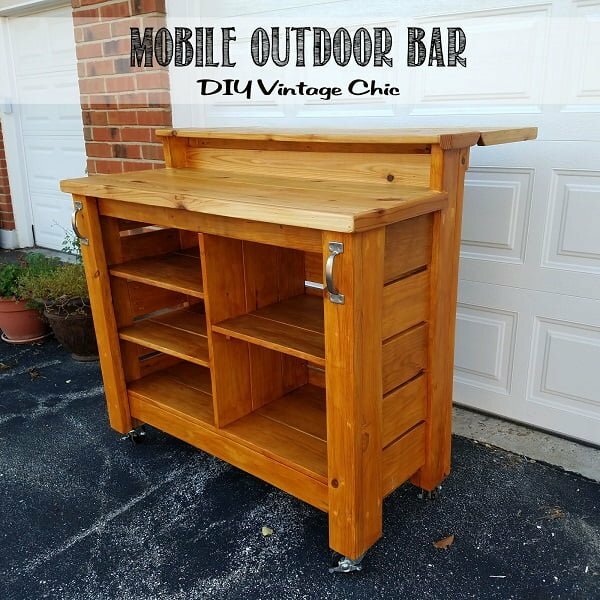 Instead of putting your baby’s old changing table out on the curb or donating it, this project lets you transform it into a home bar that you can move around as needed. 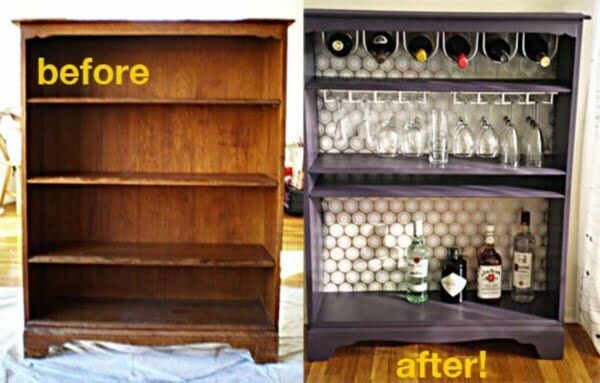 After cleaning, sanding and repainting, you can even add a wine rack to the middle or lower shelf. 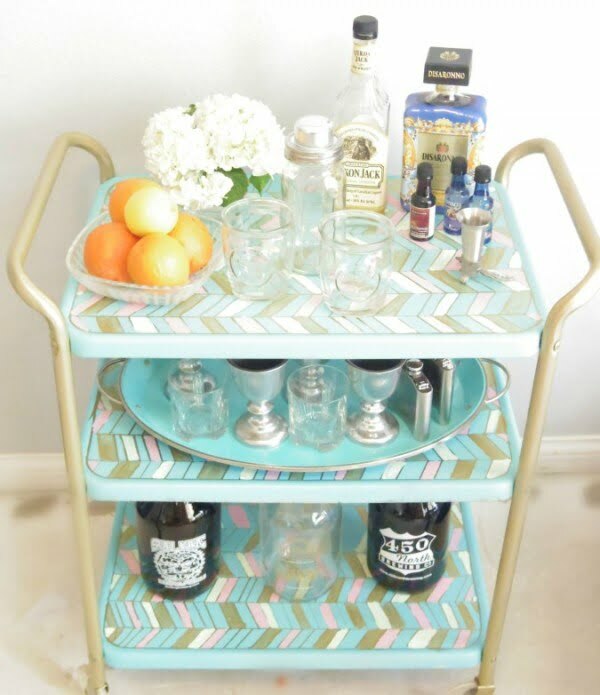 Yes, you can build a home bar cart from scratch. All you need is to have some wood crafting skills and enough materials. Here are the plans and instructions on how to do this wonderful idea. This dresser-turned wine bar is sort of a combination of Victorian and rustic. A drawer is above two wine shelves, and the top is finished with a high gloss varnish that highlights the deep grains of the oak-style surface. 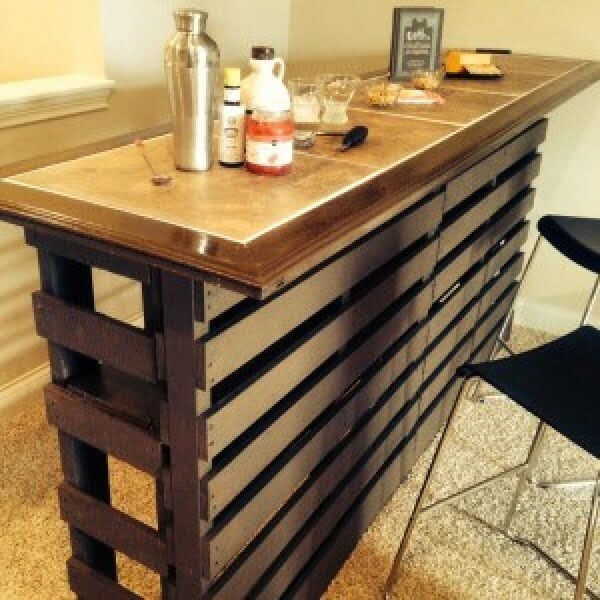 Take old wooden shipping pallets and attache them together to create your own home bar. Before attaching them, each pallet gets sanded down to remove any splinters before you can stain or paint it. 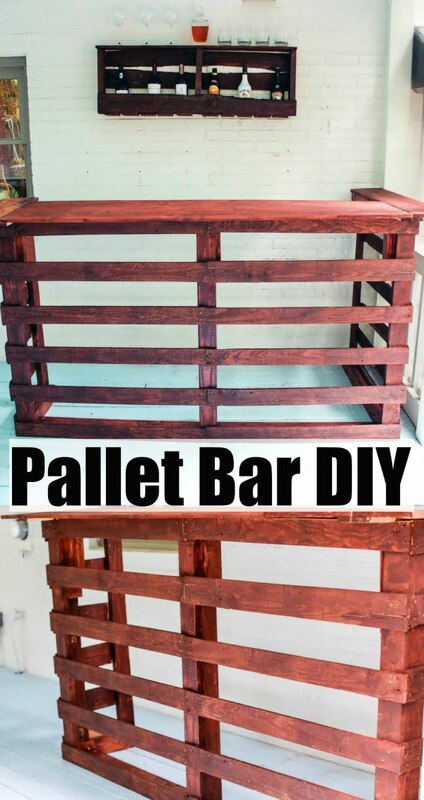 This low-cost DIY bar project requires three full-size wood pallets, along with wood screws, a cordless drill, a saw and the wood stain of your choice. A popular stain color for this project is deep cherry wood, though blonde wood stain or chestnut are also good choices for this project. Use your bottle cap collection to add color to an existing solid color wood bar top. 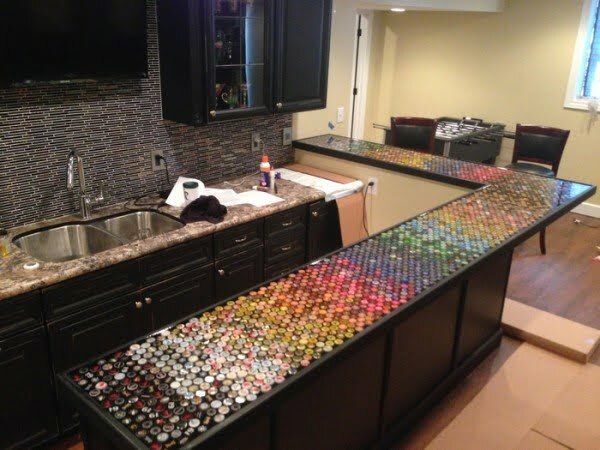 Depending on the size of the bar top and the number of bottle caps, you can create designs and color gradients that will liven up even the dullest bar top. If you prefer, you can paint the bar black or possibly a deep shade of blue or purple before gluing on the bottle caps once the paint dries. This hand-built structure gets built from a set of plans you can download for free off the Popular Mechanics website. Other needed materials include cedar fence boards, bolts, brackets, deck screws, pressure treated radius deck boards and pressure treated fence posts. 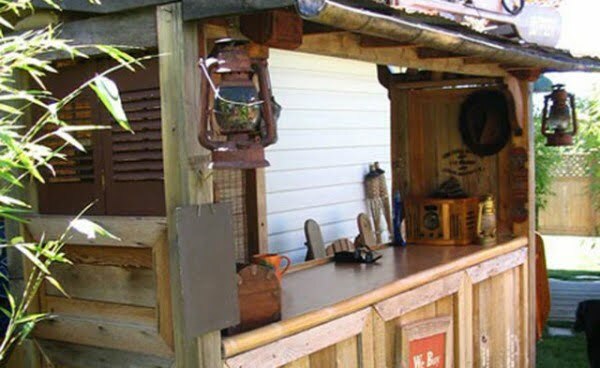 This project uses all recycled materials to build a DIY bar for your outdoor patio or back porch. Recycled wood pallets, ceramic tiles, plywood, and wood trim are just some of the needed materials. 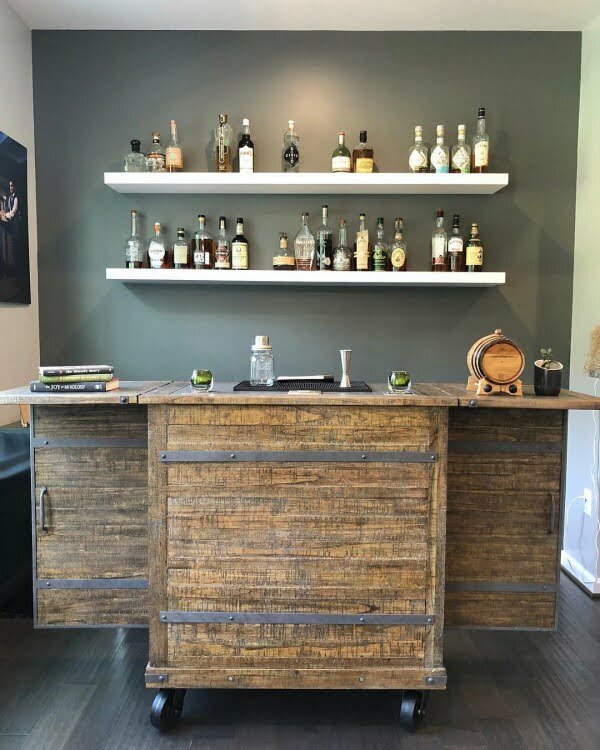 Using oak veneer plywood, this DIY bar project results in a permanent bar constructed in your home, which can be a corner or section of any room with the right amount of space available. This project revives an old metal cart by using a wire brush and drill to remove rust and any dirt. Once taken apart, cleaned and fitted back together, the cart gets spray-painted gold and the trays are painted with designs of your choice. 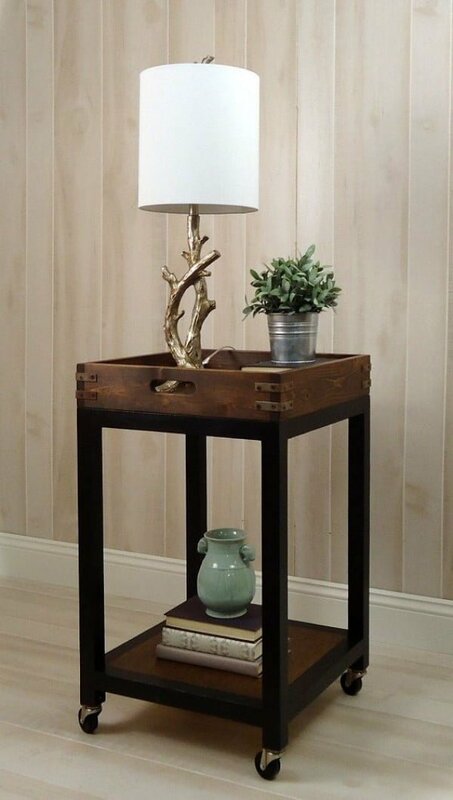 This purchased standard bar cart gets a new look with a wood tray fabricated and kept on the top section of the cart. Decorative metal straps then get screwed to each corner of the tray for a more vintage look. 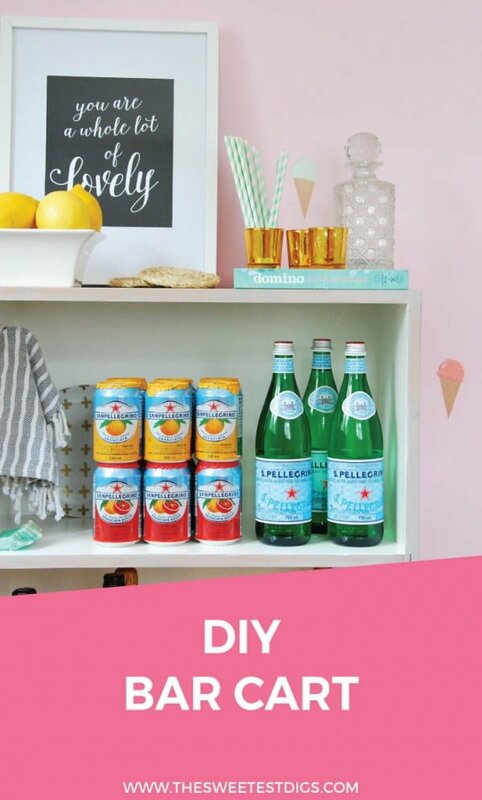 This easy DIY bar project involves simply sanding and repainting an old rattan cart with a bright color and stocking it with all your needed bar supplies. 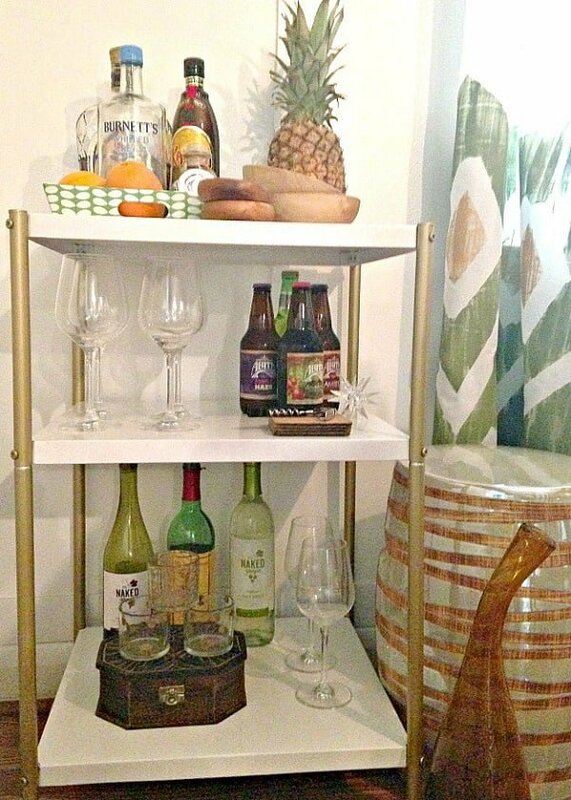 If you have an old bookcase you no longer use, you can give it new life as a bar cart that’s portable and stylish. The wood shelf in this example was refinished and coated with a new stain color. The final step is simply screwing casters to each corner of the shelf’s bottom. 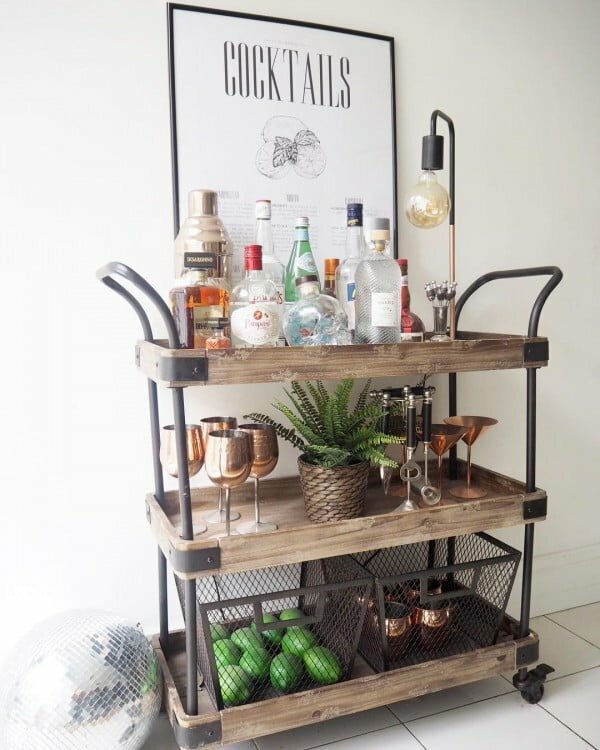 This three-shelve cart is made with black pipe and wood, and it’s great for mixing cocktails because you can store everything you need in one place. You can cut the wood shelves into dimensions of your choice, often according to available space. For more of an industrial look, you can distress the wood with the claw end of a hammer or with other sharp-ended tools. This is one you build yourself from wood cut to the right dimensions, and it’s finished with a folding top for easier storage. With a Kallex long shelf and two Kallex square shelves from Ikea, this project involves fitting them together and placing a piece of fitted glass over the bar top. 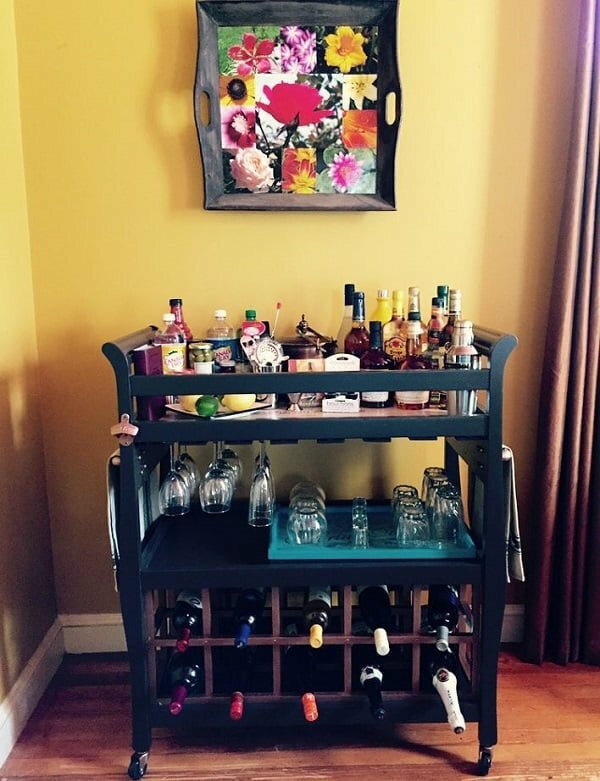 This bar project takes wood left over from a larger remodeling project, instructs you how to cut and fit it together, and build a simple but elegant rolling bar cart with top and bottom shelves. This project is fashioned from an old metal rolling cart that you take apart and remove any debris or rust before repainting it. Metal legs are attached to the three shelves, and wheels are screwed in place to the bottom of each leg of the cart. Some home bar ideas can look like a mini 1920s Chicago speakeasy. The wooden stools are topped with rich leather seats. The backdrop has plenty of room for glistening bottles and side shelves for glasses. There’s even room at the top for displaying memorabilia. 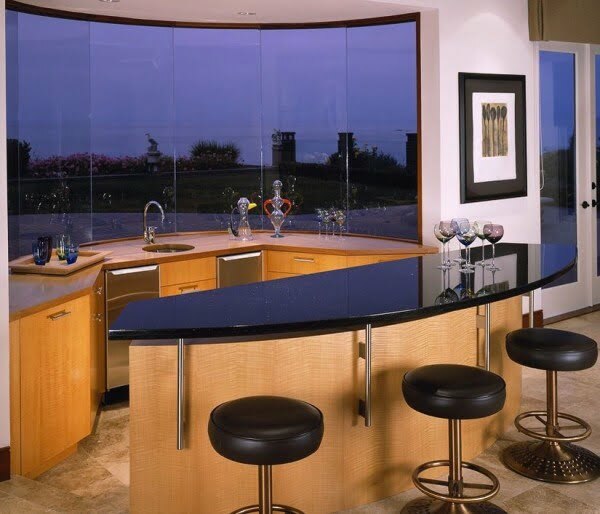 A granite top with a basin and faucet is combined with a stylish redwood stained cabinet for this home bar. 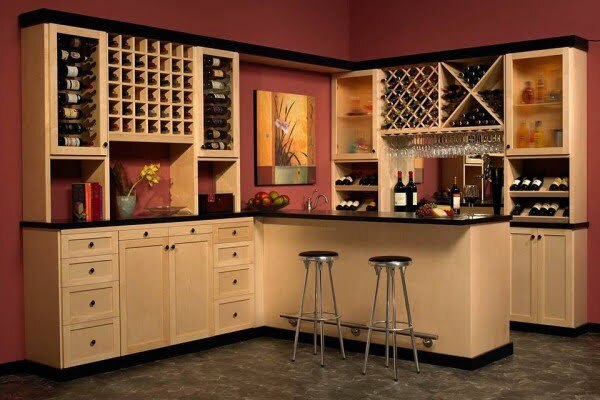 The idea of the wine bar extends to glass door cabinets which provide a lot of space for the bottle storage. This is a thoroughly modern set up. The white ceramic counter sits over a mahogany-stained wood drawer and cabinet, and these are set off to the display refrigerator on the left. Use a blue light-bulb in the refrigerator for an even more awesome effect. White glass cabinets placed above complete this ensemble. 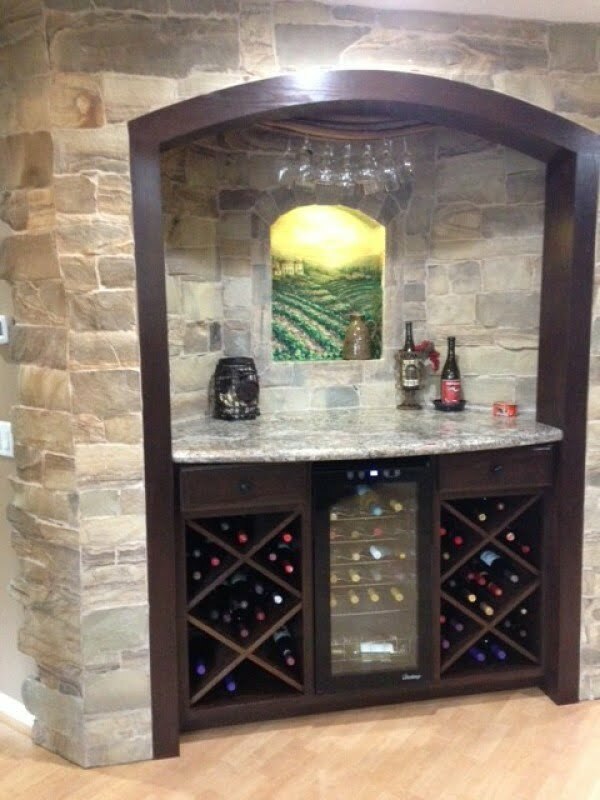 If you want a home bar to look like an Italian chapel, set the wooden frame, drawers, and cabinets into a backdrop of brick and stone. Install a granite counter and have sparkling wine glasses hanging above. For the knockout punch, install an inlaid painting of an Italian countryside highlighted with a light from behind. Turn the extra room into a TV room, but add a couple of televisions. 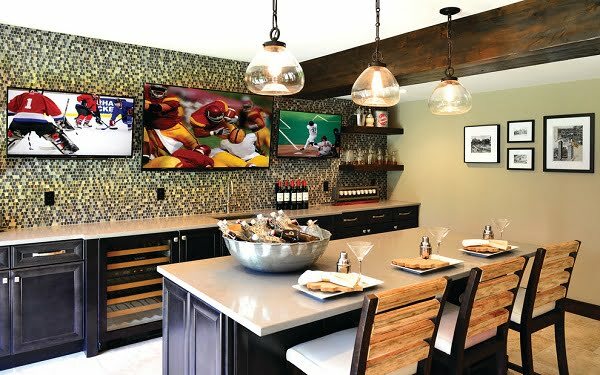 You’ve now got the makings of the perfect in-home sports bar. Use the additional space for a three-seater bar for eating and viewing in the island, and run a matching back bar across the entire room under the televisions. 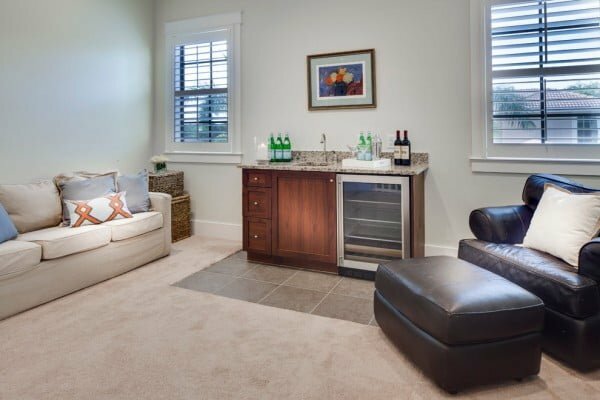 If you don’t want to take up a lot of space, consider a mobile mini-bar. A gilded framed cart on wheels with two glass shelves added. Glasses and adornments on the top, and bottles on the bottom. An added champagne bucket makes an excellent touch. 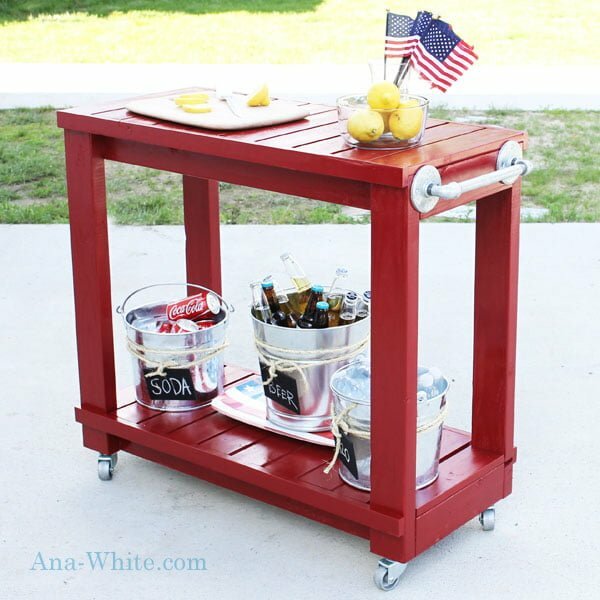 A simple three-tiered cart on wheels can be turned into an excellent outdoor mobile bar for yard parties. How you design the cart is up to you but put the glasses on top, the bottles in the middle, and the bottom cart can hold fruit and cheeses. A home bar can resemble a giant medicine cabinet, and maybe it should. Inside are four large quadrants and a pull out drawer. Inside the doors, there is shelving to store enough bottles to cure anything. When closed up it is a simple white cabinet with golden handles. 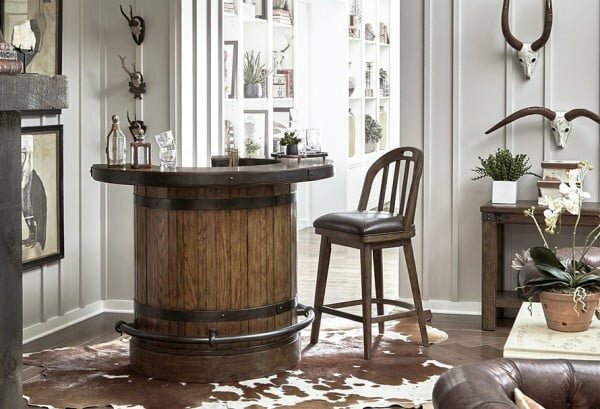 The perfect little home bar for a ranch-style house can be a simple oak barrel. Whether or not you give it a good finishing or leave it rough-like is up to you. Attach a footrest at the bottom and a half-circle bar at the top and you’re done. A combination wood-leather seat compliments this bar. A granite top and sides placed over a wood-grained panel is simple, yet elegant. Black leather seats inside gold-painted metal frames give a futuristic touch to this down-home bar idea. 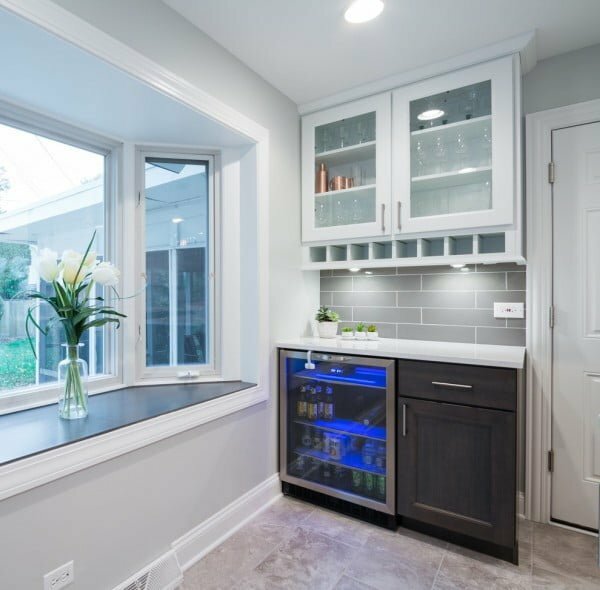 Turn extra kitchen cabinets into a beautiful home bar by removing the cabinet doors and placing wooden wine racks inside. Refinish the cabinets using a light-wood stain and make all the trimming, including the bar, a high-gloss black. Turn that huge, mobile Snap-on tool chest into a stunning home bar. Covering the lower part with wood paneling and slapping a granite bar onto the top completes the lower half. Paint the upper part and install some elegant white shelves. Place a sleek, black bar top in the front of bay windows, and use mahogany for the back bar and cabinets. Black leather seats with gold trim will give you your own metropolitan home bar. 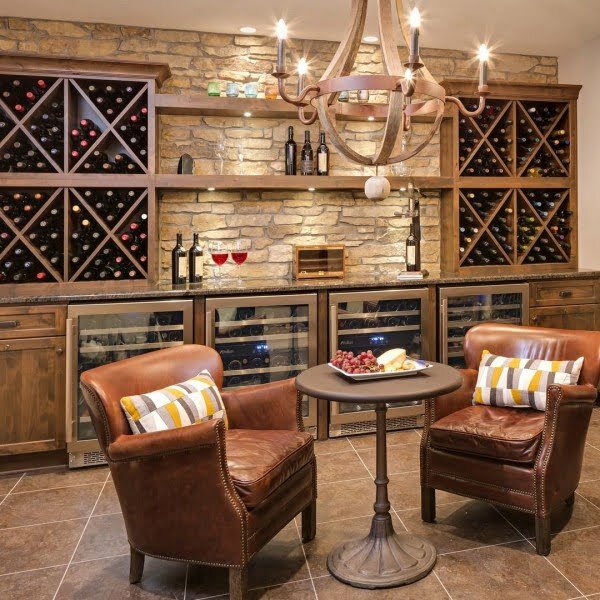 Use brick or stone paneling on your wall, and cut out squares for four wine racks on each side. A marble bar can run the length under this, and beneath the bar put two wooden cabinets on each side with four glass front cabinets in the middle.